Perhaps the most meta skill in The Sims 4, Video Gaming is just what it sounds like: the measure of your sim’s ability to play video games. 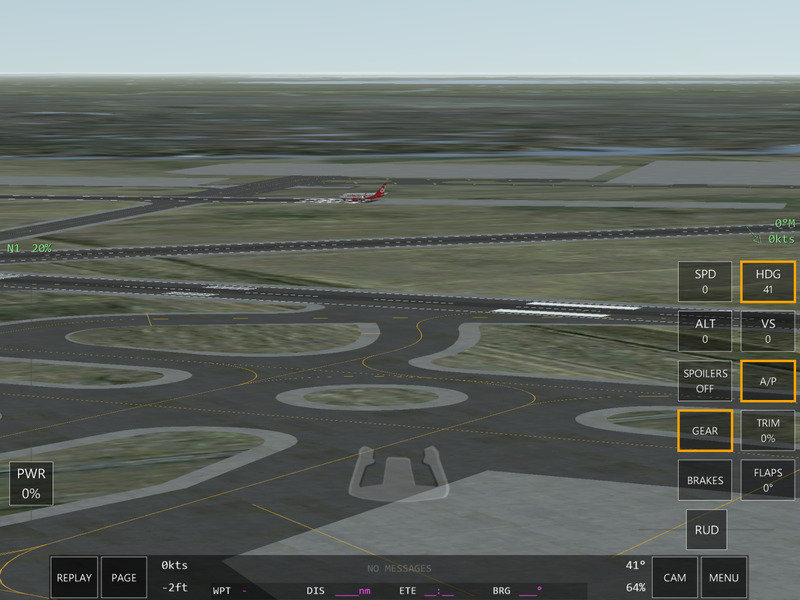 It seems like a somewhat useless skill at first glance, but with some development your sim can put it to very good use. It’s also one of the few skills that they’ll develop without your direct input, which is always a lovely little bonus. As mentioned in the previous paragraph, sims seeks out video games of their own accord. Put a computer in a house and someone will run over and use it to play video games. Consequently, most of your sims will probably develop the Video Gaming skill to some point, especially if they don’t have jobs and need something else to do. That said, you can specialize a sim in Video Gaming, in which case the Knowledge - Computer Whiz Aspiration is probably your best bet. It will give your sim the Quick Learner Trait, which is useful for developing any skill, and is heavily weighted towards the use of computers. Most gamer sims will use a computer for their gaming. Genius. Gamers will want to be Focused the majority of the time they’re playing a game, as it will develop the skill more quickly. Genius allows the Focused emotion to come up more often. 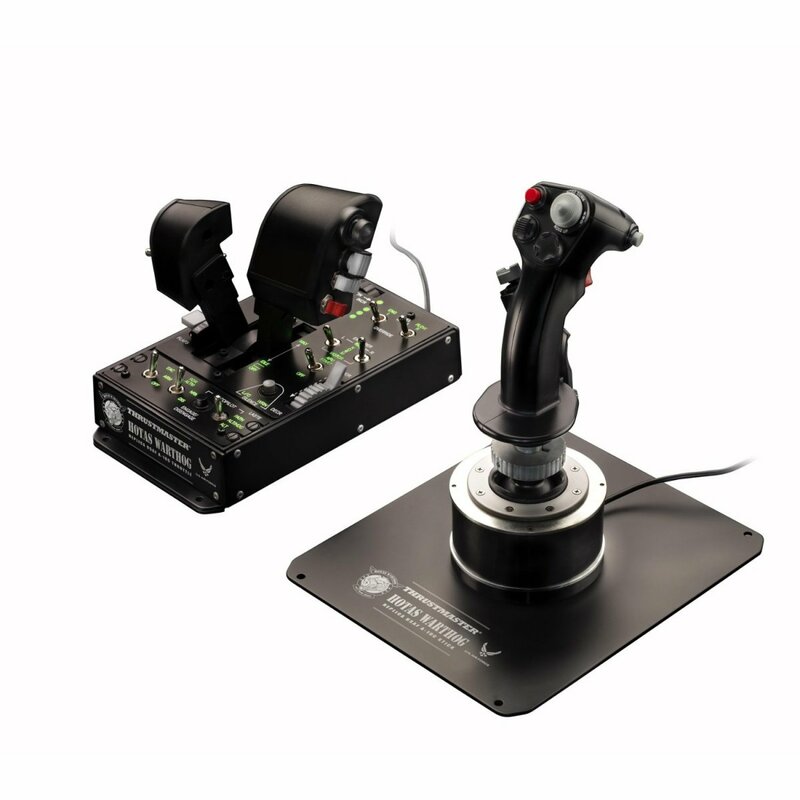 Sims often become Focused while playing video games, a relative rarity among skills, so this is doubly handy. Bookworm. This isn’t directly applicable to Video Gaming, but sims who game seriously tend to fall on the technical side of things, particularly with the Computer Whiz Aspiration. Bookworm will allow your sim to make the most of their time spent reading. 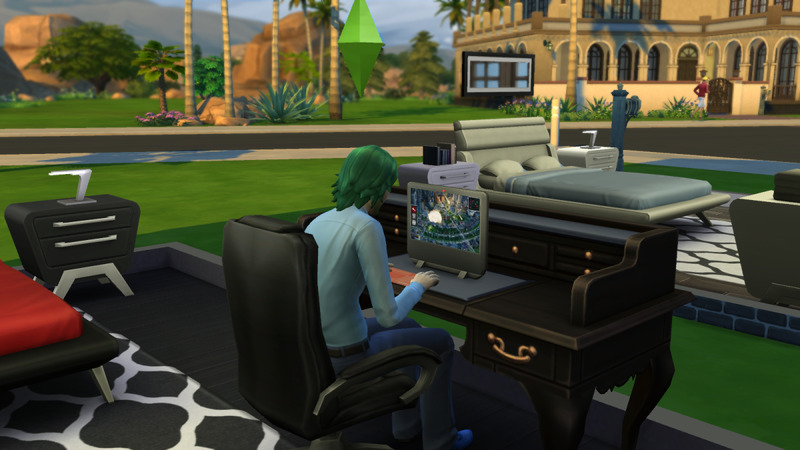 A sim playing a video game on The Sims 4. Just like real life, you actually CAN make money doing this... though you really need to commit yourself. Level 2 - Discuss Game Strategy with other sims, Play Incredible Sports, MySims Go! 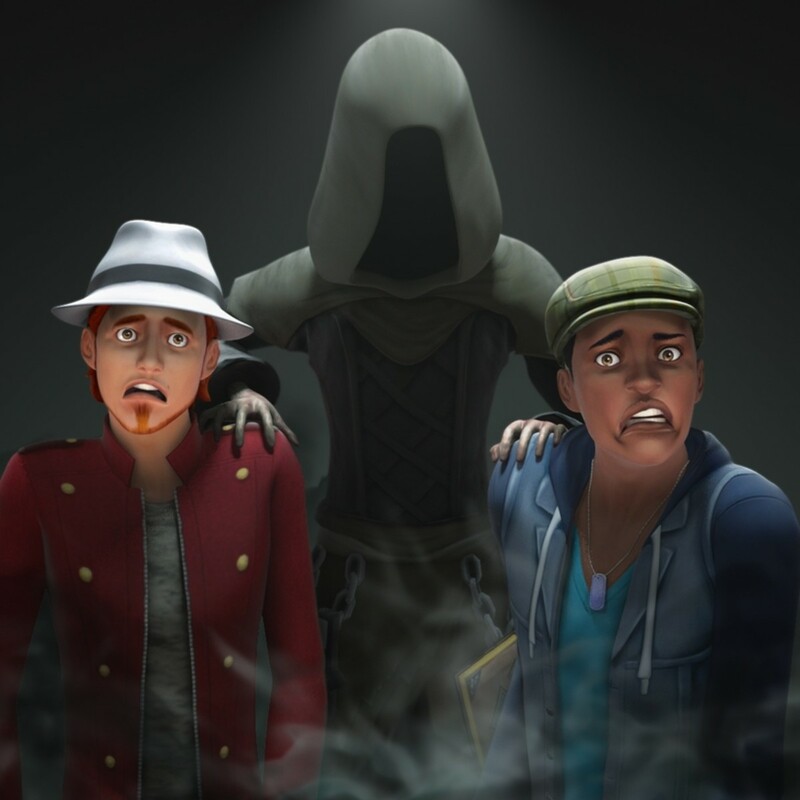 Because sims tend to use gaming as a means of getting away from troubles - it’s Fun! - you don’t need to work that hard on the Video Gaming skill. 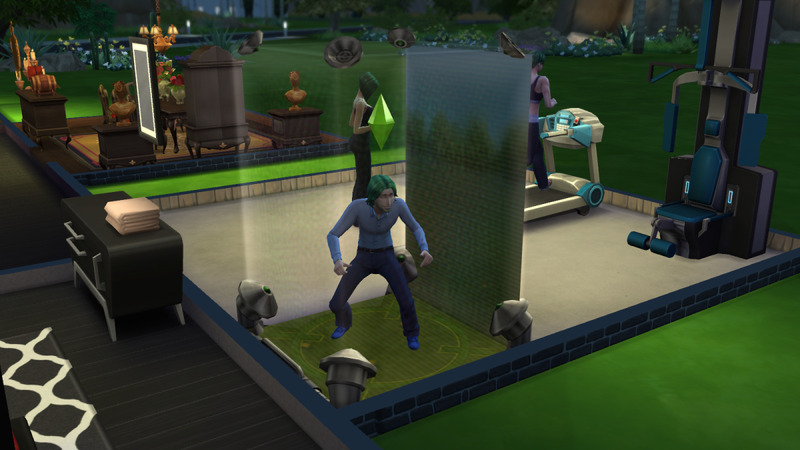 Perform other, more intensive-and-unpleasant skills, then let the sim seek out entertainment after the fact. You only need to set your sim to gaming obsessively if you want them to hit the peak of their game as quickly as possible. 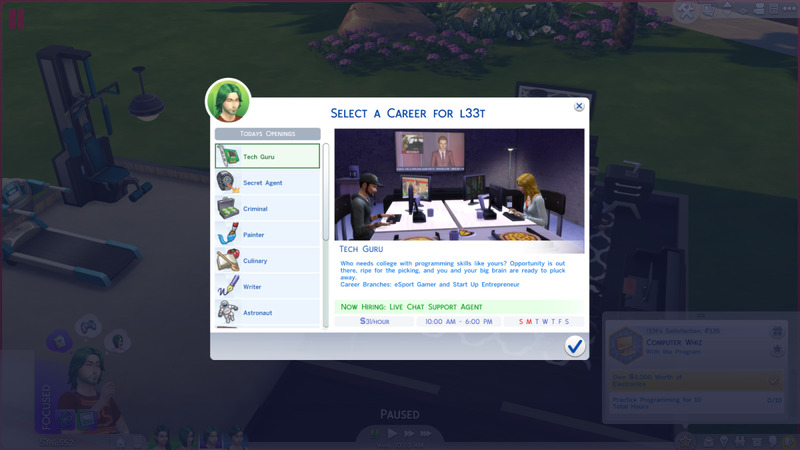 The Tech Guru career in The Sims 4. The alternative is to enrol your gamer sim in Game Tournaments, both Novice and Professional. For a small entry fee ($50 for Novice, $100 for Professional) your sim can compete against other sims online for a cash prize. At its greatest this prize can earn your sim well over $1,000 for a single tournament, lasting several hours. Because the chances of winning a tournament are annoyingly slim, however - and because you can only participate in tournaments perhaps twice a day - they constitute supplementary income at best. Your sim shouldn’t quit their day job, in short. ‘Mastering’ Video Gaming is really not that big a thing, to be honest, as you only receive the capacity to play a bunch of different video games. More visually interesting, perhaps, but not that helpful. Mastering the Computer Whiz Aspiration is probably more helpful in the long run, as it will grant your sim the Webmaster Trait, allowing the sim to utilize their computers in new and interesting ways not available to lesser sims. Not the most useful skill, perhaps, but there you have it. It means the sim can't reach the computer, for some reason. Another object must be blocking their path. If that isn't the case, go into Build Mode and move the computer / desk / chair around. Might be a minor glitch. Whenever I try to use the computer, a bubble pops up with footprints and a red X... What does this mean? ?